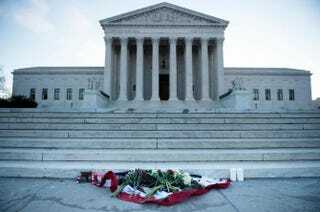 Flowers are placed in front of the U.S. Supreme Court Feb. 14, 2016, in Washington, D.C., in honor of Justice Antonin Scalia, who died Feb. 13, 2016, at the age of 79. President Barack Obama will not be attending the funeral Saturday of Justice Antonin Scalia, the White House has confirmed, NBC reports. The president, accompanied by the first lady, instead will pay his respects to Scalia Friday at the Supreme Court, where Scalia's body will be lying in repose in the Great Hall, according to the report. Vice President Joe Biden will attend the funeral at the Basilica of the National Shrine of the Immaculate Conception, the White House added. According to NBC, when asked for clarification about Obama missing the funeral, White House press secretary Josh Earnest repeated, "The president will pay his respects at the Supreme Court on Friday and he'll be joined with the first lady when he does that." When asked if Obama's Saturday plans included golfing, Earnest emphasized that Obama believes it is important to honor the justice's life and service. As news of Scalia's death broke Saturday, Obama hailed him as a "brilliant legal mind" who will "no doubt be remembered as one of the most consequential judges and thinkers to serve on the Supreme Court."